Early this week, I made a trip to Longwood Gardens, a beautiful estate out in Pennsylvania. I started this post with the intent to write about my trip and the images I captured. 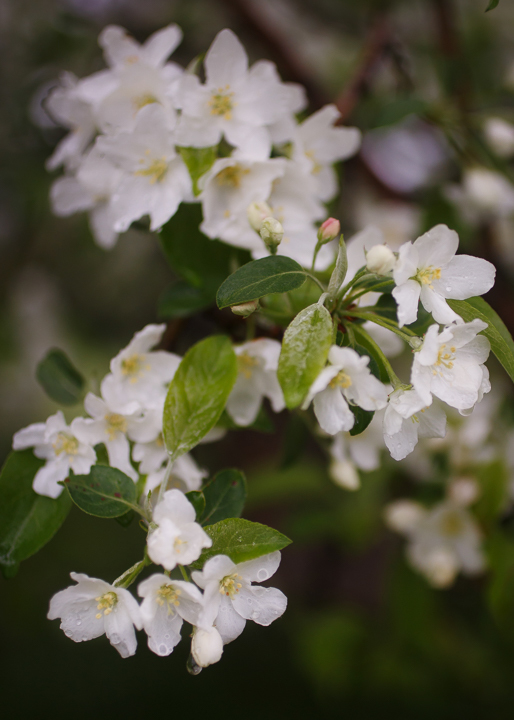 Then this morning it rained and when the rain was over I went out to photograph the delicate white flowers of my crab apple tree. I started my fine art business taking pictures of that tree. 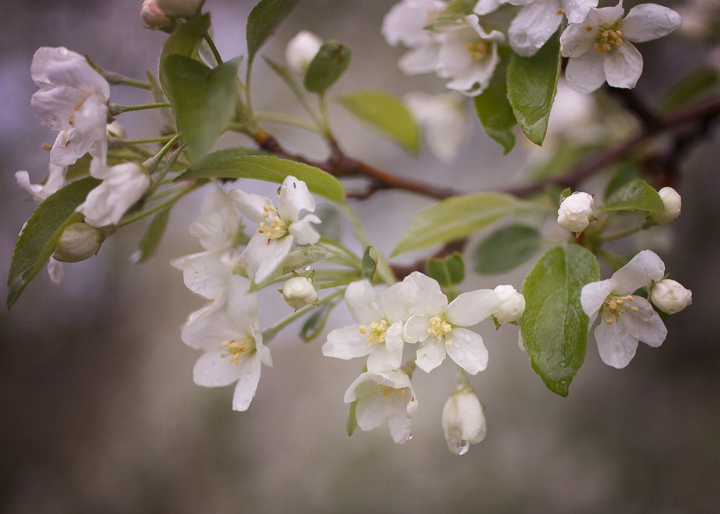 The crab apple sits on the edge of my property and its blooms fill the sky for about 1 week a year. The flowers start out as soft pink buds before they explode into life. The tree itself is home to birds and other small animals and when I was out there this morning, their soft bell-like song filled the air. Photographing the tree is a meditation in patience. I often fight the wind. Even a light breeze can cause the branches to shake too much, scattering drops of rain or soft petals and pushing the image out of focus. I can never tell if the result will be print worthy. Sometimes I love the way it looks out of camera but not in. I like about every 1 out of twenty captures and love only about 1 in 100. They are all similar in a way even when I use different lenses. I don’t care about that because they tell the story of a simple tree. If I could, I would capture every inch of it for posterity. I know this tree won’t be there forever and I want to remember how much I loved it. Over the years my children have played under it, hung swings from its low branches and built hiding spots along its base. I am glad that I get to capture the beautiful flowers for the short time it’s in bloom. I want my children to watch me from their windows, honoring my creativity. I don’t always give in to the moment the way I do when I’m out there, smelling the sweet scent of spring and feeling the cool drops of rain along my face. Each day, I rush home from my job to take them to activities, cook dinner, before I collapse into bed. They need to know that I’m not just their mother, that there is more to me than a frazzled woman trying to coordinate schedules between them and trying hard to hold it together. 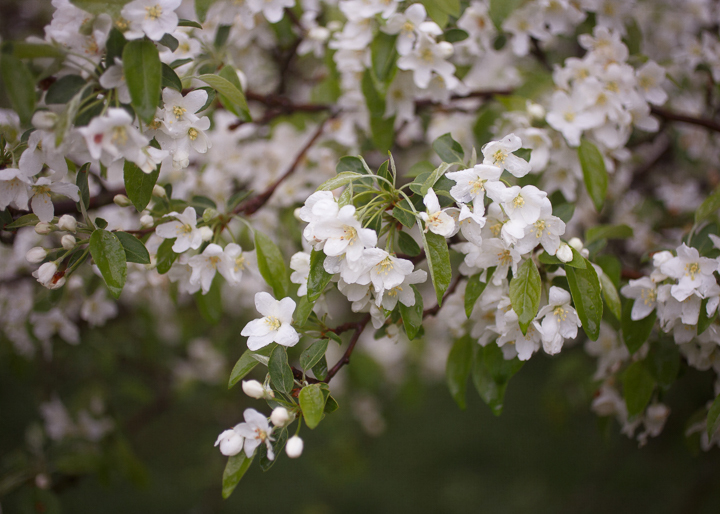 More importantly, I want them to know there is beauty in this world, even if it’s just the beauty of a common crab apple, whose flowers are tenuous and short lived.